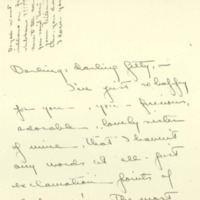 Eleanor Wilson McAdoo writes Jessie Wilson Sayre to congratulate her on her pregnancy. I'm just so happy for you, you—precious, adorable, lovely sister of mine, that I haven't any words at all—just exclamation points of gladness! The most wonderful and beautiful things in life always are beyond the reach of words, aren't they? Oh, Jetty dear, it was all I could do not to run as fast as my legs could carry me all the way to Cornish to tell you how beautiful I think it is. How I long to see you, darling. When Mother told Helen and me, we just hugged each other with joy, for we knew how happy you would be—you and Frank. Somehow, it seems more beautiful and wonderful, coming to you, than it ever has before, for you are my lovely ideal of womanhood and no-one could be more perfectly worthy of the great joy than you. I am so glad, darling, that you are so well. I think the walking trip was a bully idea—it sounded heavenly—That is, it sounded heavenly for you two—it wouldn't have been that for lazy me! I think it's so lovely that you could be up there in that delectable place—we know how perfect it can be, and we're very, very jealous. I do hope that the family can get up there the first—and then maybe a little later we can steal up for a little while. Wouldn't that be glorious. McAdoo, Eleanor Wilson, 1889-1967, “Eleanor Randolph Wilson McAdoo to Jessie Woodrow Wilson Sayre,” 1914 July 16, WWP17495, Jessie Wilson Sayre Correspondence, Woodrow Wilson Presidential Library & Museum, Staunton, Virginia.